So, I am going to share my cooking method of this baby kailan dish, and hope it may help a little, to overcome the fear of cooking baby kailan at home, after this (smile). There are so many different options to cook this delicious green and it’s very simple and quick to complete as this veggie is young and light in taste. 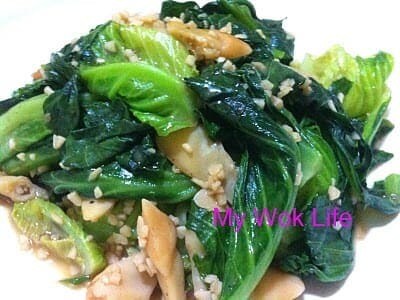 The more common ones should be the Oyster baby kailan (耗油小芥兰) and Stir-fried baby kailan with minced garlic (蒜蓉炒小芥兰). So, yes, I cooked it with the later option, and this method is more commonly known as 清炒小芥兰. 清炒 (pronounced in Mandarin as: Qing Chao) refers to stir-fry in plain. Yes, this supposed to be plain (with just some garlic), but because I had some Pacific clams left in my refrigerator, I added it to my stir-fried (laughing). No worries, both eating it plain or with addition of ‘delicate flavoured‘ ingredients, such as, pacific clams, fish balls and fish cake slices, are good, as desired. 1) Heat wok with oil over high heat. Add garlic and stir-fry for about 10 seconds till fragrant, but not browned. 2) Add baby kailan and sugar, stir fry with spatula in quick strokes. Then, add in pacific clams, if opted for. 3) When veggie starts to soften, sprinkle salt and pepper (and oyster sauce, if added with pacific clams, or if prefer more enhanced flavour in the veggie). Stir-fry to combine well. Dish up and serve. * If you not wish to eliminate the bitter taste of this dish (if any), garlic is one of the key point. Do not fry garlic till browned or burnt, leave it pale with fragrance will do, before adding baby kailan. * Adding of sugar helps to reach the same effect as well as to enhance the overall taste of the dish. This veggie dish is definitely healty and low fat. A generous portion of such counts less than 150kcal. Tips: Do not need to add extra water as gravy is not necessary in this dish. Water from the baby kailan should be sufficient to moist the veggie till it’s cooked. If really find it too dry while cooking, simply sprinkle some water with your fingers. * Fry vegetables with high heat in short cooking time in order to retain its nutrients and keep veggie fresh and grossy bright green looking with more crunchy bites.